This hand crafted, bloat-free, theme was built specifically for you to open your own marketplace online at a very low cost. 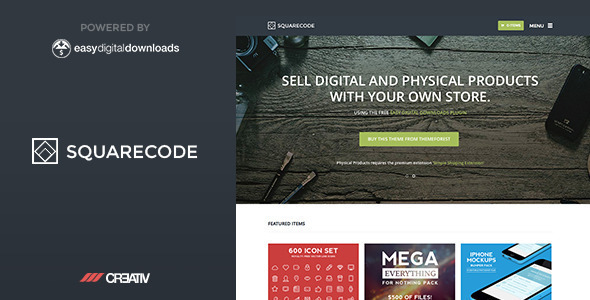 Utilizing the power of the FREE and very popular Easy Digital Downloads plugin, you can sell anything digital including items such as videos, music, digital art such as icons, filters, templates, themes, or photos etc. You only need the FREE Easy Digital Downloads plugin to power your store but you can expand to include reviews or physical goods using the low cost paid plugin options. Easily change all the colors of all the sections including header, footer, CTA areas, breadcrumb etc. via image uploads and/or color pickers in the easy to use theme options panel. Support for the WordPress customizer is also included. Quickly toggle the format of all your website by choosing full-width or boxed version layouts via the theme options panel – super quick and easy. We include support for WPML and also include mo/po files for local translation. Display your amazing work via fully responsive, color coordinated (can be altered in the theme options) players using the built-in functions of WordPress. Display each track and video in an elegant and easy to use format anywhere on your blog, pages or digital item sales pages! We also include, via our free and popular plugins, the ability to display staff profiles, portfolio section with individual project pages, and careers including display via categories. A full blog section with support for WordPress post formats is included in the main theme and a whole bunch of templates that include right sidebar and fullwidth and many automatic templates such as 404 error, site map etc. Every detailed has been poured over and tested to ensure that the flow of your selling pages is optimized. You can search or filter your digital products store, create category specific pages for digital items (photos, videos, icons etc.). A common menu system across all devices provides a cohesive experience. White spacing adds impact to sections, block quotes stand out to maximize their impact, buttons have great spacing and even file information for sale items is neatly arranged and yet flexible for different file types. The dedicated home page has an easy to use slider that will accept ANY content, video, HTML, Text or images and even short codes. It also automatically displays 3 Featured (set via a category) products and then 9 latest products. The rest of the page is any content you wish, in our example I display some fancy block quotes in a carousel, 2 pricing tables and some benefit breakdowns. This could be anything you wish however. We don’t build on a framework of multiple CSS files that are frustrating and bloated. We write each line of CSS and code in our themes, which means they are easier to edit and customize, load quicker and produce less strain on your server and provide better experience for you and your visitors. We offer a full 12 months of support from date of purchase. Our support is limited to updates, bugs and installation issues but not customization or installing the theme for you. These optional extras are available at a cost. Update on 07/17/14 – v1.0.2 – Please replace header.php, functions.php, fixes include correct color picker choice for variable product options displayed in the description section of a download page (header.php) and auto setting of color options on install (functions.php). Release on 7/17/17 – Version 1.0.1 – please replace comments.php, update the /js directory and the /functions directory. Release on 7/16/17 – Initial Release.